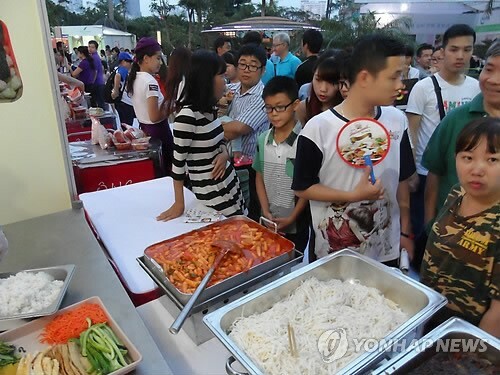 SEOUL, Oct. 7 (Yonhap) — An association of South Korean residents in Hanoi said Saturday it will hold a Korean food festival in the Vietnamese capital on Oct. 27-29 in celebration of the 25th anniversary of the two countries’ diplomatic ties. The association said it will join forces with the South Korean Embassy in Vietnam to hold the 2017 Korean Culture and Food Festival at a plaza in front of the My Dinh Stadium in Hanoi for three days. The eighth annual festival featuring various traditional Korean foods, performances, games and a prize lottery is expected to draw over 150,000 visitors, association officials forecast. This year’s event is particularly meaningful as South Korea and Vietnam celebrate the 25th anniversary of diplomatic relation in 2017, they noted. Organizers plan to set up about 120 food booths around the main stage and offer cooking classes in cooperation with food companies from both countries, they said. Korean entertainers, including Haha and Lee Kwang-soo, will meet their local fans at the festival, the officials said, noting proceeds from the event will be donated to underprivileged people in Vietnam.